This comfortable yet elegant Green Mountain Vermont home, designed by Boston interior design firm Elizabeth Swartz Interiors, is featured in Cottage Country magazine. The breathtaking views of the mountainside landscape were the inspiration for the home’s interior décor. 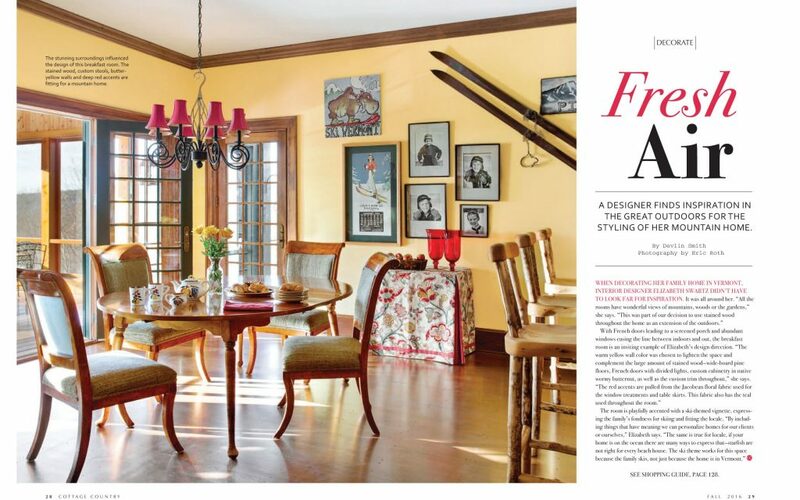 “The warm yellow wall color wash was chosen to lighten the space and complement the large amount of stained wood – wide-board pine floors, French doors with divided lights, custom cabinetry in native butternut, as well as the custom trim throughout,” says Elizabeth in the article. “The red accents are pulled from the Jacobean floral fabric used for the window treatments and the table skirts. The fabric also has the teal used throughout the room.” The house was designed to function as both a primary home for an active family well as a gathering place for guests during ski season & for summer vacations.